Long the preserve of geeky enthusiasts, bitcoin is going mainstream in Asia, attracting Mrs Watanabe — the metaphorical Japanese housewife investor — South Korean retirees and thousands of others trying to escape rock-bottom savings rates by investing in the cryptocurrency. Asia’s moms and pops, regular investors in stock and futures markets, have been dazzled by bitcoin’s 100 percent surge so far this year. In comparison, the broader Asian stocks benchmark has gained 17 percent over the same period. Even after a tumble from last week’s record $2,779.08 high, bitcoin rose more than 60 percent in May alone, driven higher in part by investors in Japan and South Korea stepping in as China cooled after a central bank crackdown earlier this year. Over the last two weeks, and encouraged by Japan’s recognition of bitcoin as legal tender in April, exchanges say interest has jumped from the two countries. Bitcoin trades at a premium in both, because of tough money-laundering rules that make it hard for people to move bitcoin in and out. “After I first heard about the bitcoin scheme, I was so excited I couldn’t sleep. It’s like buying a dream,” said Mutsuko Higo, a 55-year-old Japanese social insurance and labor consultant who bought around 200,000 yen ($1,800) worth of bitcoin in March to supplement her retirement savings. Christopher David uses a Robocoin kiosk to sell bitcoins outside of the 500 Startups’ Bitcoinferance in Mountain View, Calif., March 20, 2014. Asia has proved fertile ground for bitcoin because of the region’s thriving retail investment culture, where swapping investment tips is common. China, Japan and South Korea are home to several of the world’s busiest cryptocurrency exchanges, according to a ranking by CoinMarketCap. The risks, though, are rising too. Bitcoin is largely unregulated across Asia, while rules governing bitcoin exchanges can be patchy. 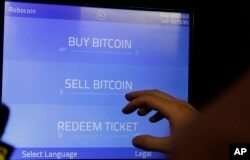 In Hong Kong, bitcoin exchanges operate under money service operator licenses, like money changers, while in South Korea they are regulated similar to online shopping malls, trading physical goods. Often there are no rules on investor protection. Park and Higo were drawn into bitcoin by friends. Others are attracted through seminars, social media groups and blogs penned by amateur investors. Noboru Hanaki, a 27-year-old Japanese web marketer and bitcoin investor, said his personal finance blog gets around 30,000 page views each month. The most popular post is an explanation of bitcoin, he said, noting that when the bitcoin price surged last month, readership of the article doubled. Rachel Poole, a Hong Kong-based kindergarten teacher, said she read about bitcoin in the press, and bought five bitcoins in March for around HK$40,000 ($5,100) after studying blogs on the topic. She kept four as an investment and has made HK$12,000 tax-free trading the fifth after classes. “I wish I’d done it earlier,” she said. A policewoman talks to a group of Nepalese men, who have invested in bitcoin, outside the police headquarters in Hong Kong Feb. 11, 2015. Hong Kong lawmakers at that time urged authorities to ban bitcoin as more than 25 people flocked to police headquarters to complain over a scam involving the digital currency that media estimate could have duped investors of up to $387 million. The bitcoin frenzy has spawned scams, with police in South Korea last month uncovering a $55 million cryptocurrency pyramid scheme that sucked in thousands of homemakers, workers and self-employed businessmen seduced by slick marketing and promises of wealth. Leonhard Weese, president of the Bitcoin Association of Hong Kong and a bitcoin investor, warned amateur investors against speculating in the digital currency. Some larger exchanges have voluntarily adopted security measures and compensation guarantees, according to their websites, although there are dozens of smaller platforms operating more or less unchecked. In South Korea, the Financial Services Commission (FSC) has set up a task force to explore regulating cryptocurrencies, but it has not set a timeline for publishing its conclusions, an official there said. In Japan — where memories are still fresh of the spectacular 2014 collapse of Mt. Gox, the world’s biggest bitcoin exchange at the time — the Financial Services Agency (FSA) said it supervises bitcoin exchanges, but not traders or investors. Some professional investors say bitcoin can be a useful hedge to help diversify a portfolio, but investors should be cautious. “This is an extremely volatile and innovative asset class,” said Pietro Ventani, managing director of APP Advisers, an asset allocation strategy firm.